The Illinois Tollway is going ahead with a $25 million environmental study of a plan to extend state Route 53, even though the project is no longer designated a local priority. 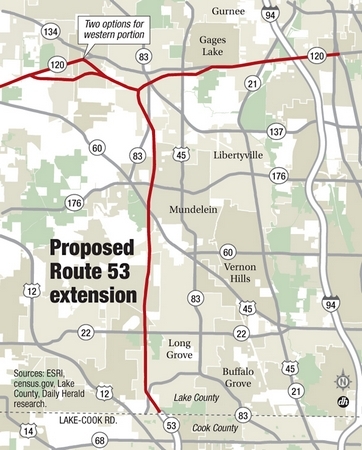 Last month, the region's planning agency knocked the controversial, long-debated proposal to extend Route 53 from Cook County into Lake County off its priority list. This means it is no longer eligible for federal funds. Vantage Specialty Chemicals in Gurnee reported to another office at the EPA that during 2014 it released 6,412 pounds of ethylene oxide — more than either Sterigenics or Medline did during the same period. ... where it may be prudent to dig an underground tunnel through Gurnee for that leg of the Route 53 Extension. Note to Toll Authority Ops: That ought to wrap up that environmental study of yours. Please send the $25,000,000 to lakecountyeye@gmail.com. Your Last Chance to Vote!